does the selling for you. Whether you want to extend the opening hours of your farm shop without increasing your personnel, or want to entirely pass on your sales operation to a safe pair of hands. The milk vending machine is always available to your customers. Always keeping your farm’s daily fresh milk so it is always available fresh and around the clock for the customer – to do this appoint an assistant for your farm sales who will make you life a lot easier clean, more rapid, reliable. 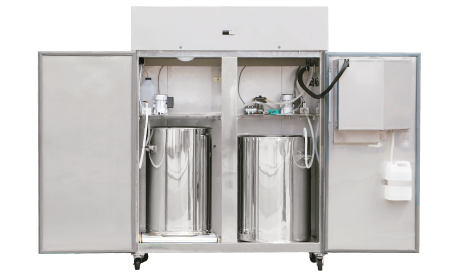 It stores the milk, cools it and stirs it, and ultimately also provides for the output depending on the quantity ordered. At the press of a button your customers receive precisely the amount of milk that they have paid for and have seen represented on the display. 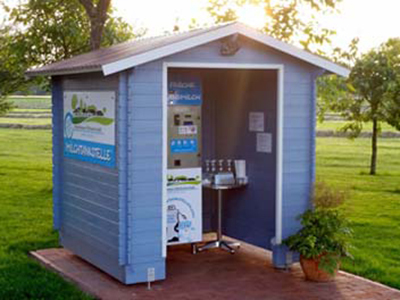 On request you can also obtain your milk vending machines with a battery backup in accordance with applicable EU directives and with certification. If there is a power cut, the battery completes the job, e.g. if customers are being served at that moment in time. And obviously your milk vending machine also does not have any language barriers. It masters German, English and Spanish as well as a number of languages of our Eastern European neighbours. Feel free to get in touch with us, we provide consultancy throughout Europe. The technology is flexible and can be adjusted to ensure the clean and appetising presentation and sale of your fresh farm milk. in milk units and shown on the display. What can the milk vending machine do? • In the event of a power failure the filling process that has started will be terminated and the remaining money will be paid out.